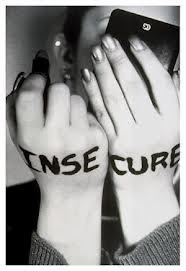 I am continuing here in the process I've been walking in relation to the word 'insecure' and how I've seen myself live this out throughout my life. While I was searching for an image for my blog yesterday, the one opening up about how I have lived 'insecurity' in my life - I was reminded how much more outflows of insecurity exist then I was actually seeing in writing it out. My experience specifically was in relation to a relationship - wherein I was feeling insecure and as if I was doing something wrong or I was not adequate and this mostly coming from that point already established within myself and so from here, looking for it in a relationship. When that does not provide what one is looking for in such a stance, then the reactions come and the experience of feeling inadequate is seen more clearly. 304: Is there a Cure for Insecurity? That is the word I would use to describe the experience I've had in the last few days. Here I am going to deconstruct my relationship to this word and how I've lived it throughout my life, as I see it's a word, I've defined and thus LIVE as a living word. Well hello, story of my life. Although I have seen changes within me and my overall experience within myself and within my life the last few years, with the support of the Desteni Process - I can see how throughout my life and here now, coming through quite predominantly, this experience of being 'insecure'. 303: What is Possible in One Day? Here I am challenging the ideas I've come to accept in relation to 'how' I self investigate within my process as self writing and looking at points/relationships I have created towards all things in my life/living and expose to myself another form of resistance I've created towards writing and how that is in fact self-sabotaging. Tonight's blog is a point I wanted to clear up in relation to the Desteni I Process Google Hangout I participated in last Thursday, where me and some other destonians discussed 'Stopping a Weed Addiction' and the various points within that. Obviously one could go on about this addiction and it's behaviors and consequences for much longer than a half an hour, yet what was mentioned in the hangout is a cool support point for anyone looking for solutions in stopping their addiction to weed or to anything for that matter because the reality is that weed is not necessarily addictive, it's the nature of the relationship one created to/towards a particular point that one 'uses'. So in this case of the Google Hangout, and in my case, I did create an addictive relationship/dependency towards weed. So check it out if you find yourself in a similar situation and ready to take back your life and give new direction to where you are heading. 300: What's Up with our Words? 297: Why Aren't You Reading My Mind?